Lapointe, Pierre Louis. "Sainte-Catherine". The Canadian Encyclopedia, 17 July 2015, Historica Canada. https://www.thecanadianencyclopedia.ca/en/article/sainte-catherine. Accessed 20 April 2019. Sainte-Catherine was the original site of the Jesuit Iroquois mission founded in 1676 and later moved to Caughnawaga (now Kahnawake). 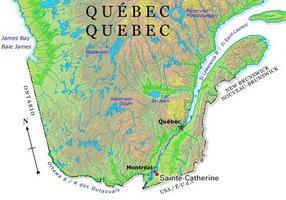 The name Sainte-Catherine was quite probably chosen in honour of Kateri (Catherine) TEKAKWITHA. Her empty tomb is located across from the Roman Catholic church. Sainte-Catherine, Qué, City, pop 16 211 (2006c), 15 953 (2001c), inc 1973. Sainte-Catherine is located some 25 km south of MONTRÉAL on the South Shore of the St Lawrence River, opposite a number of ST LAWRENCE SEAWAY lift locks. It was first set up as a parish municipality in 1937 under a longer version of the name, Sainte-Catherine-d'Alexandrie-de-Laprairie. The shortened version was used after its incorporation as a town. Sainte-Catherine was the original site of the Jesuit Iroquois mission founded in 1676 and later moved to Caughnawaga (now Kahnawake). The name Sainte-Catherine was quite probably chosen in honour of Kateri (Catherine) TEKAKWITHA. Her empty tomb is located across from the Roman Catholic church. A shrine dedicated to her is in the Saint-François Xavier Mission at Kahnawake, which lies west of the town. 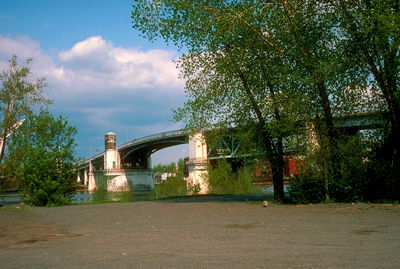 As with many suburban Montréal-area municipalities, Sainte-Catherine's development really began in the 1950s and was spurred on by the easier access given to Île de Montréal by the opening of the Mercier (1934) and Champlain (1962) bridges. Today its industrial park, well served by road, rail and port facilities, is home to a mixture of light industry. Sainte-Catherine is the starting point for an elaborate network of cycling paths. Récré-O-parc, a nature park and beach, is located along the St Lawrence River and the Lachine Rapids, offering a scenic view of Île de Montréal.